As he has done almost every year since he first ran for elective office in 1996, Virginia Senator Mark Warner (D-Alexandria) marched in the annual Buena Vista Labor Day parade and spoke to a gathering of local citizens and political activists from around the state. In an interview with the Charlottesville Libertarian Examiner, Warner looked forward to what Congress is likely to do between its return from its summer recess next week and Election Day in November. Warner said he hopes that Congress “will have a bipartisan plan to put on the desk either of Mr. Obama or Mr. Romney after the election,” noting that he personally favors the re-election of President Obama. This contrasts, Warner explained, with his experience as a business executive and as a governor, when “we had budgets we had to meet” or face adverse consequences. Warner also commented on what former Governor Tim Kaine, the Democratic candidate for the U.S. Senate from Virginia this year, could do to attract the votes of those who cast ballots for neither Barack Obama nor Mitt Romney in the presidential race. “My sense is that 2010 was a year where folks were mad and a lot of folks got to Congress and expressed that anger by just saying no to everything,” he said. 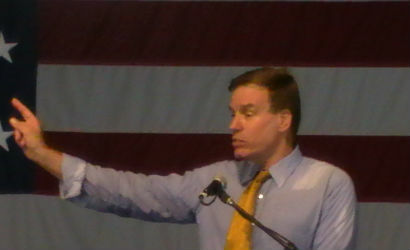 The 2012 election will be different from the 2010 election, Warner predicted.